Genesis The Legend of Galahad (USA) in 17:50.16 by The8bitbeast. The Legend of Galahad is a side-scrolling adventure/platformer for the Sega Genesis. The game is a port of Leander for the Amiga, which was the first game developed by Travellers Tales. You play as Galahad on his quest to stop the Wicked Wiz of the East who has made off with Princess Leandra. Galahad must explore 21 levels in 3 different worlds in search of a hidden key in each level to progress, collecting coins to buy rune bombs, armor, and sword upgrades along the way. 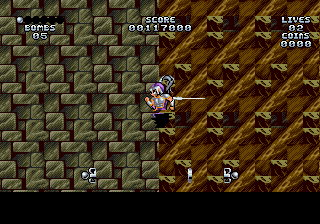 The8bitbeast rushes through this game quickly, especially once the Tempest Blade upgrade is obtained. It is carefully managed to provide well-timed speedups in the player's movement, and it also leads to some zipping glitches. For more details, see the run's comments.